Quest bars have the best nutritional profile of any protein bar on the market bar none. We’ve got 20 grams of protein, 4 grams non-fibre carbs, and no sugar alcohols or other junk. And most importantly, our bars taste better than any other bars. Quest Bars use cross flow filtered whey protein isolate, the highest quality protein with no soy or added sugar and absolutely no junk! With just 2-7g active carbs and 100% gluten free they will help you achieve your goals no matter what they are. At Quest, we refuse to compromise on taste or nutrition. That’s why we don’t use fillers, cheap proteins or junk ingredients. All flavours are not only filled with nutrition but they are the best tasting bars on the market. Range of flavours which taste like the actual names! 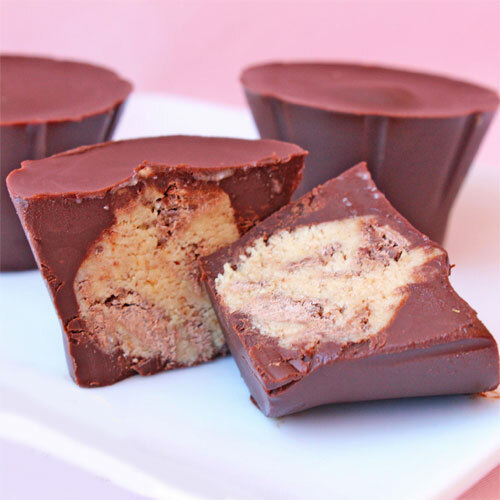 If you're looking for a delicious clean sweet treat, try making Quest Chocolate Chip Cookie Dough Cups. These are super easy to make and will definitely satisfy those sweet cravings. 1. In a microwave safe bowl, combine chocolate chips and coconut oil. 2. Microwave for 30 seconds, remove and stir. 3. Place back into the microwave for 10-15 second increments stirring in between until chocolate is melted. 4. Spoon melted chocolate into each candy cup mold until almost halfway full. 5. Roll Quest bar pieces into round balls and drop into each chocolate cup, lightly pressing it down into the chocolate. Top with remaining chocolate and place in the refrigerator for 3-4 hours or until hardened. Enjoy! "I use Quest Bars all the time - even when I'm getting ready for a competition because they let me get in quality proteins without the carbs. They have made a HUGE difference for me - allowing me to get and STAY lean without all of the hard work I used to have to do. No matter how many I seem to eat, I still look forward to them more than just about any meal. I have them in my car, desk and purse so I am never in a position of being unable to get in a nutritious meal." Other Ingredients: Protein Blend (37%) (Milk Protein Isolate, Wtiey Protein Isolate), PrebioOc Fibre (Soluble Com Fibre), Almonds. Water, White Chocolate Pieces (6%) [Cocoa Butter (3%), Milk Protein Isolate, Sweeteners (Erythntoi Sucralose. Steviol Glycosides), Natural Flavours, Flavour Enhancer (Sea Salt)]. Dried Blueberries (3%), Natural Flavours. Sweeteners (Erythntoi. Sucralose, Steviol Glycosides), Cocoa Butter (1%). Flavour Enhancer (Sea Salt), Flavour (Cinnamon). Thickeners (Cellulose Gum. Xanthan Gum). Raising Agent (Sodium Bicarbonate). Allergen Warning: This product contains almonds and milk derived ingredients. This product was manufactured in a facility that also processes tree nuts and peanuts. Formulated Supplementary Sports Food. This food is not a sole source of nutrition and should be used in conjunction with a nutntious diet and appropriate physical training or exercise program. Not suitable for children under 15 years of age or pregnant women. Should only be used under medical or dietetic supervision.